If your boys anything like mine, then they love cars. any kind of cars…race cars, luxury cars, dragsters, monster trucks…you name it. If it has wheels and goes fast, they love it. 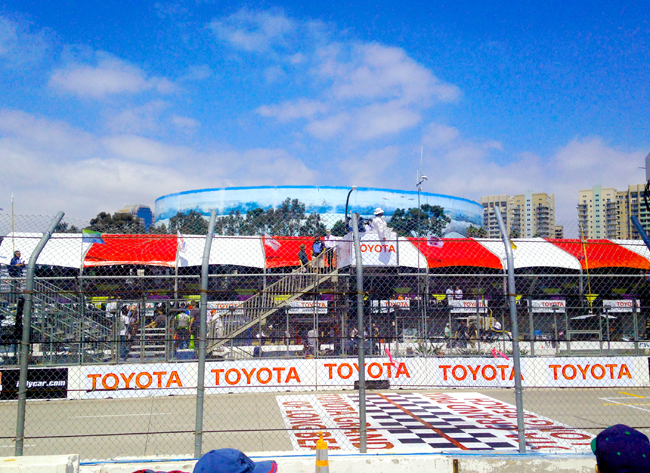 Last weekend, Verizon FiOS Socal gave us a chance to hit the race tracks at the Toyota Grand Prix in Long Beach. It was such an awesome experience for them. 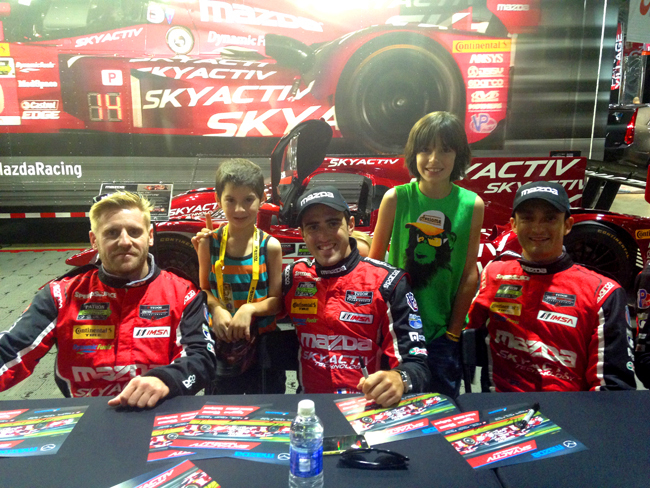 They got to see real live race cars in action, as well as the whole racing atmosphere. It’s a lot different to experience it in person, than it is watching on television for sure. The noise, the crowds, the stands…it is thrilling to be able to able to experience it first hand. This is my littlest’s first reaction to hearing the race cars for the first time. He was soooo excited. Click on the sound icon to hear his little voice. Not having taken my boys to the races before, I forgot about a few things I didn’t have to worry about when I attended races sans kids. For instance…the noise. Race car engines are really loud. I should have remembered this, as we have been to many monster truck events. Almost too loud for many adults, so you can imaging how loud it is for kids. Also, the tracks are big…so there can be a lot of walking. Having little kids in tow makes going up and down the stands and traveling around the race area more difficult. 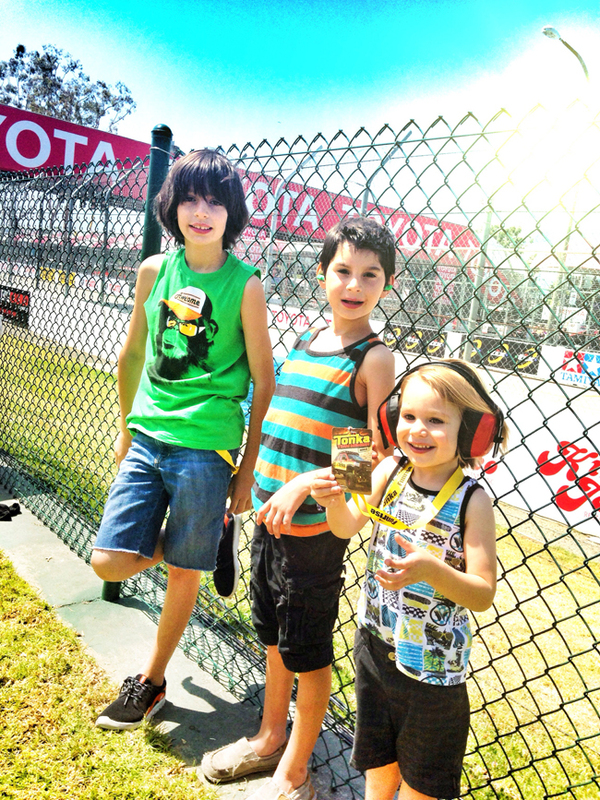 I thought I share a few tips on taking kids to the races. If it’s your first time taking your kids, then these tips may be helpful to you in planning your outing. These tips can also pertain to Monster Truck, Motocross and any type of racing event. • Bring noise canceling headphones. The noise is really loud, especially loud for children’s sensitive ears. This will make the races 100% more enjoyable for the kids. You can’t always find headphones at the venue…and if you do, plan on paying a lot more than you would at a store such as Walmart or Target. The next best thing would be earplugs, however, they are a pain for most kids to keep in….and plan on loosing a few. I think we went through 5 sets with just one of my kids. • Wear tennis shoes. Most of the time there is a lot of walking, and the bleacher or grand stands have a lot of steps. You don’t want to have to worry about a kid loosing their shoe or complaining that their feet hurt. Flip flops are not a good choice. • Bring a backpack…and ditch the stroller. Although I am sure there are ways you can take your stroller through handicap access points, the easiest thing is to pack light, put everything you need in a back pack and leave the stroller at home. This will save you lots of time, as there are lots of steps, whether with the stadium seating or overpass bridges that allow fans to go over the race tracks. It would have been a nightmare trying to maneuver a stroller among the crowds of people. Other items that would be a bonus in the backpack would be: a lightweight blanket, wet wipes, children’s tylenol (just in case they get a headache), bandaids (my boys got blisters, and we had to search for bandaids). • Bring drinks for the kids. I hear “I’m thirsty” almost every time I turn around. Many racetracks are makeshift, so they don’t have water fountains close by. Bringing a water bottles for my boy is the best thing I did all day. If you can manage bringing some snacks…do that too. • Suncreen. You will need sunscreen in most cases…unless your event is at night. The sun beats down on the concrete track, and even if it is overcast, you are at risk for a sunburn. • Cash. A lot of the vendors take cash only. If you want to grab a bite to eat, or get a souvenir…you may only be able to do so if you have cash. • Be Flexible. Just know that you may not end up staying the entire time. Sometimes kids get restless and can’t handle staying the whole time. Other than that, just be prepared to have an exciting adventure with your kids. 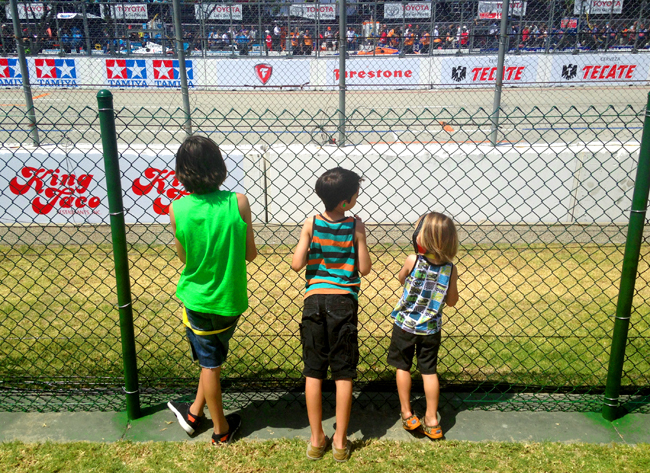 My boys love the races…I see us attend many more times in the future. And we would especially like to thank FiOS SoCal for having us!